When cinephiles talk about the French cinema of the early 1960s, they tend to focus on the New Wave and its fellow travelers, to the exclusion of just about everything else. Since Jean-Luc Godard, François Truffaut, and their cohorts from Cahiers Du Cinéma and the Left Bank were rebelling against and subverting their era’s mainstream cinema, the reasoning goes that there isn’t much to be gained from examining it. Problem is, this approach makes the conversation willfully lopsided, leaving out popular films of the day and populist filmmakers like Philippe de Broca. In the interest of restoring some balance, Cohen Media Group has put out a pair of de Broca/Jean-Paul Belmondo films made in the comic-adventure mode of Belgian artist Hergé, whose Tintin books were getting live-action adaptations around the same time. In fact, de Broca was approached about directing one of them, but opted instead to invent his own story, taking Hergé as his unofficial inspiration, and mixing in a dash of James Bond for good measure. The resulting concoction was 1964’s That Man From Rio, which required the services of four screenwriters (de Broca included) to send Belmondo off on a picturesque adventure filled with a logic-bending plot and death-defying stunts, many of which the athletic actor insisted on performing himself. Adrien Dufourquet (Belmondo) is a soldier on a week’s leave in Paris, planning to spend the downtime with his fiancée, Agnès (Françoise Dorléac, playing both sides of the fence, since she starred in Truffaut’s The Soft Skin the same year). But almost immediately after he reaches Agnès’ apartment, she’s kidnapped right before his eyes. Spurred to tail her captors to the airport and then onto a plane bound for the titular city, Adrien arrives with no money, no luggage, and only the slightest idea of how he’s going to rescue Agnès, or what it all has to do with the theft of a rare artifact from a lost civilization, and the search for its two counterparts. To the screenwriters’ credit (de Broca and his co-writers received an Academy Award nomination for Best Original Screenplay for the film), the action moves along at such a rapid clip, there’s little time to worry about how much the plot relies on incredible coincidences. Then again, Georges Delerue’s score signals at every turn that it’s a breezy comedy, the kind where a character can request a pink car with green stars from a street urchin, and be seen driving it one cut later. Sometimes, realism is beside the point. An acknowledged influence on Raiders Of The Lost Ark—and, to a lesser extent, Indiana Jones And The Temple of Doom—That Man From Rio was an enormous hit in France. It also did well when it was released on the arthouse circuit in America, which was how Steven Spielberg got to see it as an impressionable 17-year-old. (Spielberg completed the circle three decades after Raiders when he made his own, long-gestating Tintin film.) Since success in the film business begets imitation, de Broca was pressed to make a sequel the very next year, which he declined. Instead, he and frequent writing collaborator Daniel Boulanger chose to tackle a loose adaptation of Jules Verne’s Tribulations Of A Chinaman In China, which was retitled Up To His Ears for its U.S. release. The film was de Broca’s third film with Belmondo, who plays Arthur Lempereur, one of the wealthiest men in France. In spite of his success, Arthur is so tired of life, he’s attempted suicide nine times in the space of a week while on a cruise with his fiancée and future mother-in-law. Then his financial advisor tells him he’s bankrupt, at which point Arthur takes out a $2 million life insurance policy and arranges his own murder. The reality that he might actually die awakens his dormant survival instinct, though, and with the aid of his loyal valet, Leon (Jean Rochefort), he evades the men he believes are out to assassinate him and jets off to the Himalayas to cancel the contract with his inscrutable mentor, Mr. Goh (Valéry Inkijinoff, a Russian actor playing Chinese), who stands to be one of his beneficiaries. In an attempt to replicate That Man From Rio’s performance at the box office, de Broca and his producers went bigger in every respect with their follow-up. Instead of a one-way trip from France to Brazil, Up To His Ears zips from Hong Kong to India to Tibet and back again. And in place of Dorléac, Belmondo’s female co-star is Dr. No Bond girl Ursula Andress, who enlivens her every scene as a striptease artist conducting an anthropological study of the male of the species. The backdrops are more exotic than in Rio, the stunts look more dangerous, and the comedy is more slapstick-oriented. The breakneck pace becomes wearying, though, as the action rarely pauses long enough for the characters or the audience to catch their breath. What came off as effortless in That Man From Rio becomes exhausting in Up To His Ears, proving the adage that bigger isn’t always better. 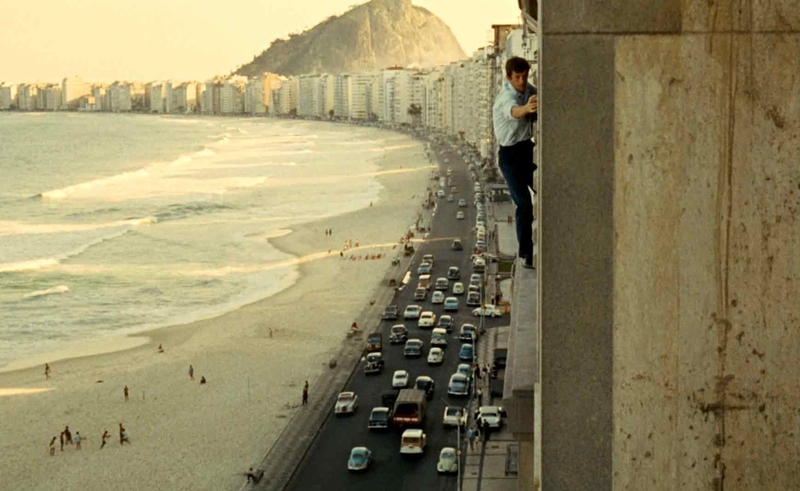 Perhaps the moment in That Man From Rio that sums up this disparity best comes when Adrien and Agnès are on the road from Rio to the still-new capital of Brasilia, behaving like a bickering couple on a leisurely drive instead of a globetrotting adventure. She points out various sites he couldn’t care less about, prompting her to ask, “How can you be blasé amidst all these wonders?” If Up To His Ears existed in isolation, it would be easier to appreciate the wonders it puts on display. As it stands, it can’t help but pale in comparison to its fleeter forebear. Fittingly, That Man From Rio merits a making-of doc that runs more than an hour, while Up To His Ears gets one less than half that length. Both draw extensively from an archival interview with de Broca (who died in 2004), supplemented by new ones with several of his collaborators. Additional featurettes focus on his work with Delerue, whose music for That Man From Rio is presented in stereo for the first time, screenwriter Jean-Paul Rappeneau, who went on to be a filmmaker in his own right, and Rochefort, who is highly amused by his own stories. Also amusing: That Man’s original trailer, hosted by Belmondo, who calls the story “damned complicated,” and feigns outrage over all the stunt work he was made to do.